The hardy work crew takes care of business with the historic Ranch House in the background. 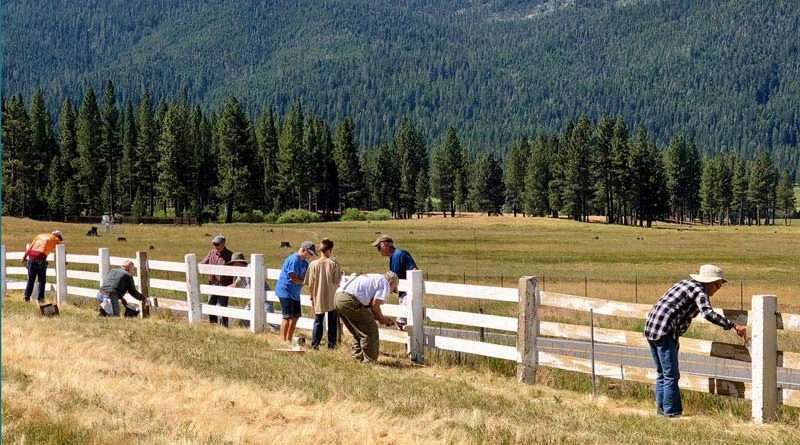 Travelers along Highway 89 in the Mohawk Valley were surprised by the brightness of the newly painted fence at White Sulphur Springs Ranch in Clio. On June 21, 14 volunteers painted more than 100 yards of fence after the entire length was pressure washed single-handedly by Mark Cowan. The old coat was peeling and after pressure washing, little of the old paint remained. Judging by the number of drivers honking and waving at the work crew, it was much appreciated. 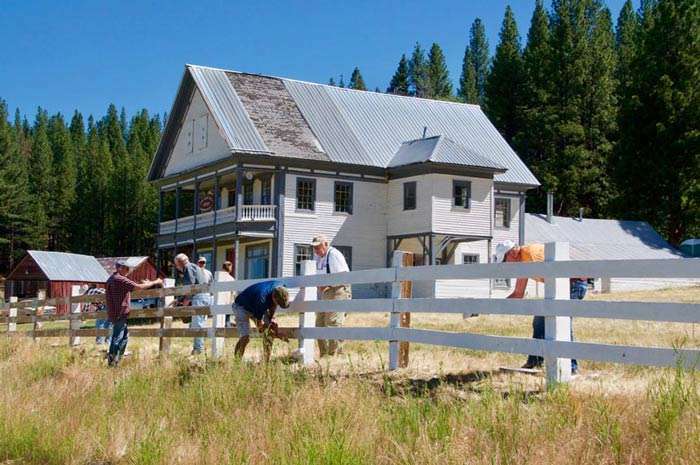 Painting the fence was just another effort to improve the property prior to Summerfest 2018, the annual fundraiser to raise funds to restore White Sulphur Springs Ranch. The 14 hardy workers were a small fraction of the more than 100 volunteers helping the Mohawk Valley Stewardship Council restore the history and heritage of the ranch. New volunteers wanting to be a part of this community effort should call Judy at 836-0254 or go to the website at WhiteSulphurSpringsRanch.com. This year, Summerfest will take place July 7. It is the 10th annual concert fundraiser and will feature two top entertainers and a hearty picnic buffet along with both live and silent auctions. Tickets are $50 per adult and only $15 for kids 12 and under, either online or at the door. Adult tickets are also available at Eco Centric in Graeagle. White Sulphur Springs Ranch is located at 2200 Highway 89, one quarter of a mile south of County Road A-15. Summerfest is an outdoor event so guests should bring lawn chairs, but no pets.